If ever there was a shop where the flowers, the colour and the fragrance were to rival that of the Garden of Eden then its Country Floral at 369 Great South Papakura. 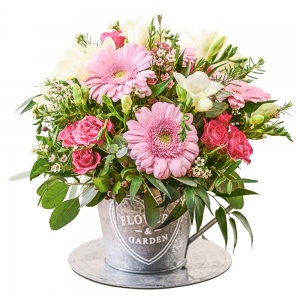 What’s more owner of 14 years Irene Bickerton, can honestly say her working day is spent in a little piece of paradise – a showroom bursting with beautiful blooms for the home, office or those special occasions. 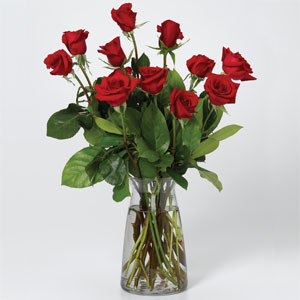 “Giving beautiful flowers is the ultimate form of expression, especially when words are simply not enough,” says Irene. 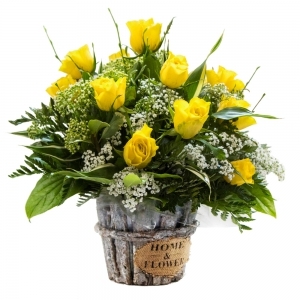 Today her talented team knows well that a carefully selected bouquet or a stunning floral arrangement is the perfect way to show friends or family that you care. 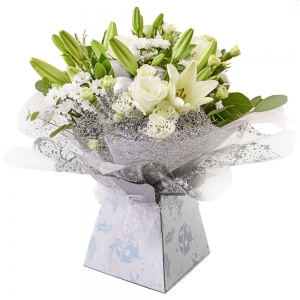 “Flowers offer congratulations, sympathy, a touch of kindness. 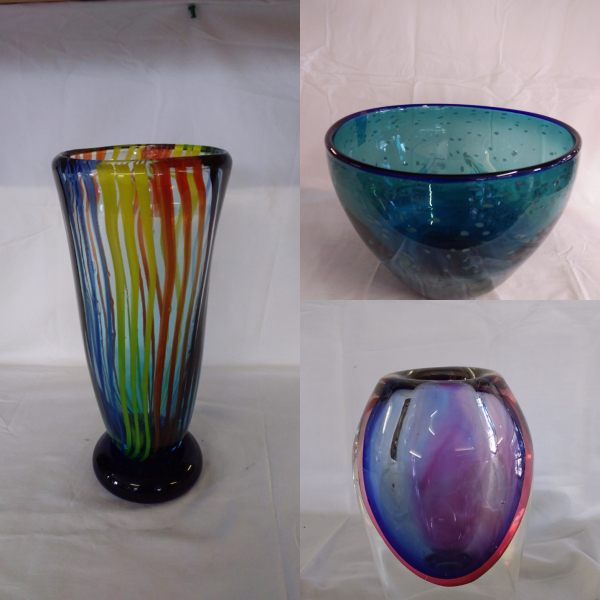 They can add the finishing touch to décor, provide a sense of welcome in a foyer or reception area or just say, ‘I’m thinking of you’,” says Irene who buys fresh from the markets up to three times a week. 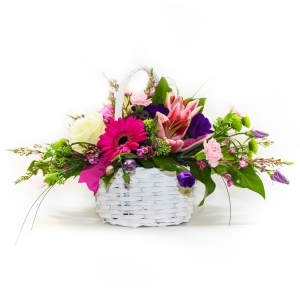 We create individual bouquets and arrangements to suit your requirements, and add beautiful wraps to enhance the flowers. 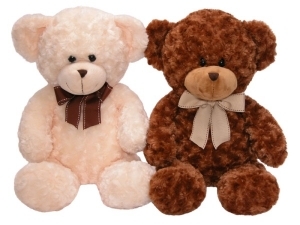 We are stockists of Wild Ferns body products- Manuka Honey, Rotorua Mud and Lanolin ranges, helium balloons, soft toys including Silver Tag Bears, potted plants and a large gift range there will be something to suit. 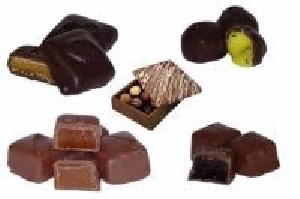 We are located in Papakura and deliver Auckland wide. Great service and easy access to website. Awesome Customer Service. Went the extra mile to ensure my flowers were delivered on time when other florists let me down. Thank you so much Country Floral. I will definitely be using your services in the future. A bit of a rip off really. 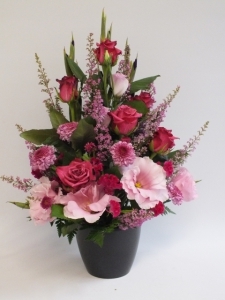 $60 for a small posy delivered. Very small as it turns out. I have bought flowers in person from this florist before and was much, much happier. Delivery was early and presentation of floral arrangement I was told was very nice. Absolutely over the moon with the flowers as was the recipient. Would definitely recommend. In Summary What was received was excatly what i wanted and what was shown on the web site and at the correct time. What else could i ask for. Well done . Will use again and recommend. Fantastic online service. I can' believe the fast turnaround. I booked Friday night and they were delivered before lunch on Saturday. Beautiful bouquet. Great communication including a text to let me know that they had been delivered. Will definitely use this service again. Thanks! Thank you for the excellent service and updates. The recipient had sent me a photo of the lovely flowers delivered, but brill that you sent me one too! Brilliant service. Couldn't fault it. 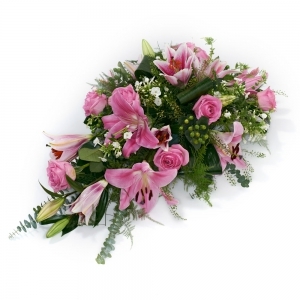 Ordered from Ireland and they were delivered on Mother's Day without any issue. Lovely flowers delivered promptly. Excellent communications kept me informed. 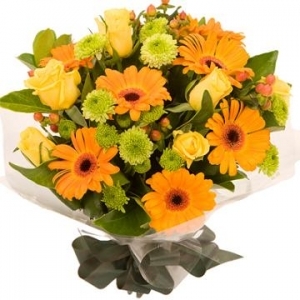 Excellent service with flowers delivered within 3 hours of ordering. Gorgeous looking bouquet that, according to recipient, smelled amazing. 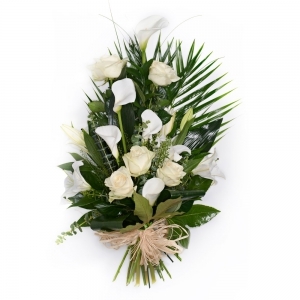 I was very pleased with the service provided by direct2florist. 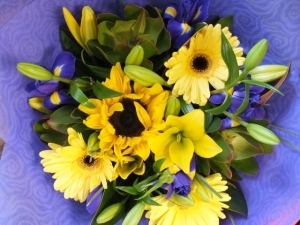 It was good to have the confirmation when delivery was made and to see an image of the flowers that were delivered. I would not hesitate to use them again. The recipient of the flowers is very happy with what she got. She described it as an "attractive arrangement". I specified a morning delivery for the next day, and that was indeed what happened. I will be using this florist again for this part of Auckland. 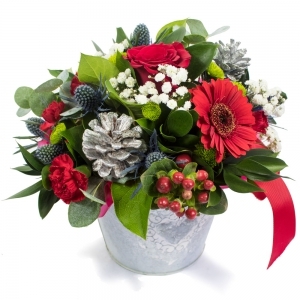 My friends were absolutely delighted first with vibrant colour secondly freshness, flowers chosen and lastly delivered before Christmas day which was extremely appreciated at such short notice. My Mum was very happy - job well done . The flowers arrived promptly and were just as I would have chosen myself. <br/>A wonderful, hassle free service. 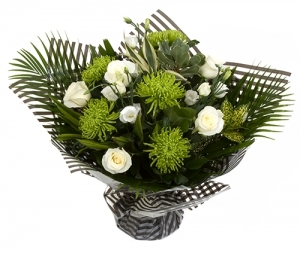 Absolutely beautiful bouquet and a good quantity of roses supplied in the arrangement. 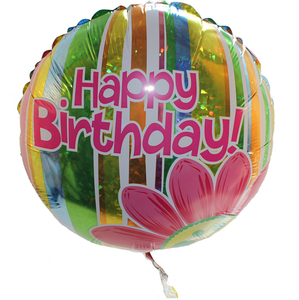 Excellent service and *I really liked the photo received from the supplier of the arrangement sent. Everything went to plan, the right flowers on the right day. I was even sent a phot of the flowers and told when they were delivered. Would highy recommend. 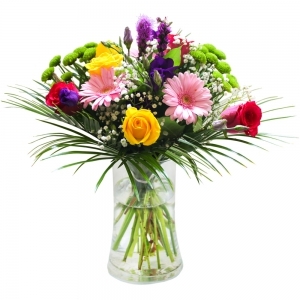 The recipient loved her flowers and said they were absolutely beautiful. Fast service. Flowers were beautiful and colourful. Will keep using them. At short notice, these guys came through. Thank you! I definately would recommend these guys, they are awesome, my mum was impressed she said they were lovely when they delivered her beautiful flowers and remembered to close the gate to keep the resident rabbit in. This is the second time I've ordered flowers from these guys, I live in Perth WA, the flowers were delivered on the same day in Auckland NZ how awesome is that and they sent me a courtesy email just to let me know that the flowers advertsiesd in the picture weren't available so they used these other flowers instead, I'm sticking with these guys they know how to make people feel special they are awesome, thanks Irene and team for taking care of us and "Turoa"
Thank you so much. My mum loved the gorgeous flower arrsngement you created for her for mothers day. Beautiful flowers,thankyou. My mother loved them. 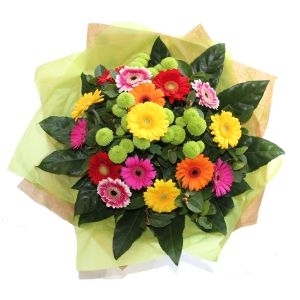 The recipient was very pleased with the selection of flowers presented, much appreciated by me also!! Great and &#55356;&#57146; looked awesome have recommended to lots of people this Is the 2nd time using web site 1st went to Australia for funeral Thanks so much. My Mum was absolutely delighted by the flowers - they were top notch! I was very impressed that the florist processed the order so quickly. They look beautiful. Thank You. Flowers were very easy to order. Arrived promptly on the day and at the time I specified. 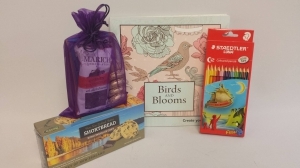 Recipient was very happy with them. Would definitely recommend, and use again. Thank you. Fast delivery and great service! Was disappointed with picture on website compared to what Angela received. Seemed a lot smaller. 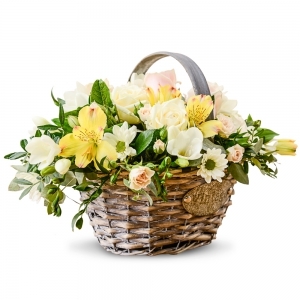 The receiver was very happy and said the flowers were very beautiful. Beautiful flowers!! Very fresh and fast delivery! 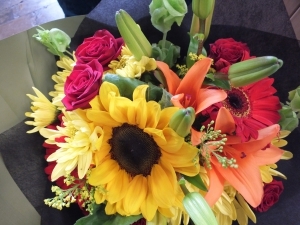 Sent birthday flowers from UK to my sister in New Zealand. 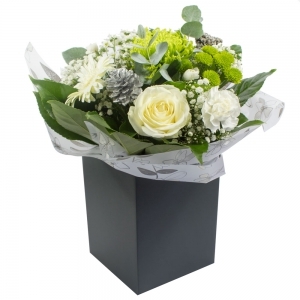 I found great bouquet options, it was easy to order and most importantly when the flowers arrived (on time) they were absolutely beautiful - exactly like what I had selected off the website. I'm delighted with this service and will definitely be using you again and recommending to friends and family. Thank you. More attention to the requested delivery date needed. Very pleased.My daughter said they were the best flowers she had ever been sent. Flowers delivered on time and were beautiful. Thank you. Delivered exactly the type and colour of flowers asked to celebrate our daughter and her husband's wedding anniversary. They were delighted and I'll definitely use Country Floral again. Many thanks from someone 12,000 miles from our nearest and dearest! The flowers were received and declared to be gorgeous! One absolutely delighted niece and one delighted aunt. The flowers were exactly what I wanted for her special birthday. Will definitely be using this florist again as she made sure everything was perfect. Excellent service. Would not hesitate to recommend. All special requirements met. As I live in the U.K the internet page had lots of great selection. Would used this service again. My mother-in law was thrilled with the flowers. 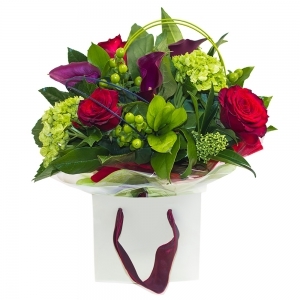 I have no hesitation in recommending this florist - absolutely fabulous flowers and delivery was perfect...thank you! Will use again when I sending flowers to Auckland! Loved the flowers and they made a slight change but it was perfect n just right! Fast and great for overseas deliveries. Reciepients were very pleased with the flowrs, A* transaction. My friend loved the flowers and the service was excellent. I can't believe how easy it was to arrange a delivery from Uk to Auckland, NZ. Send someone some sunshine. 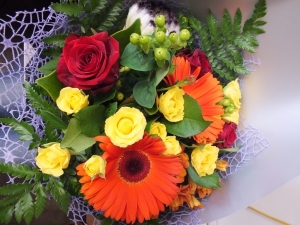 A bouquet of Gerberas, Button Chrysanthemums and Roses in Autumn tones. 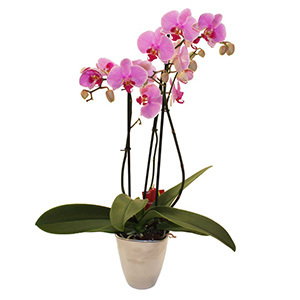 Simple floral gesture to add delight to any occasion. Substitution policy applies, we will do our best to ensure the flowers are as close to displayed picture, due to season availability. 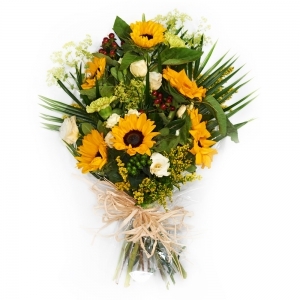 A bright mix of flowers including sunflowers, lillies, roses, gentian and a great selection of greenery. Your chioce as a bouquet or a water filled vox. Substitution policy applies, we will do our best to ensure the flowers are as close to displayed picture, due to season availability. 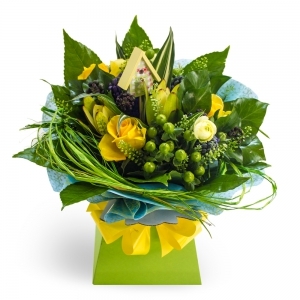 Summer blue, yellow roses and lillies combined with either Iris or Gentian in blue. 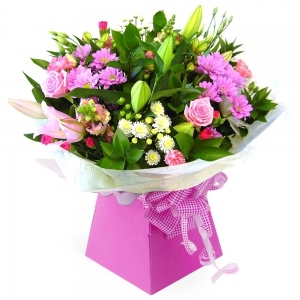 A great way to welcome the new boy to the family or a nice bright bunch of birthday flowers. Substitution policy applies, we will do our best to ensure the flowers are as close to displayed picture, due to season availability. Beautifully arranged with seasonal flowers. Substitution policy applies, we will do our best to ensure the flowers are as close to displayed picture, due to season availability. 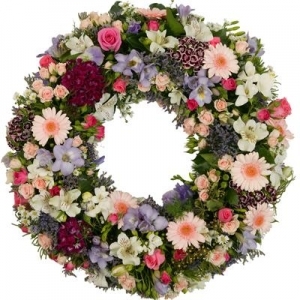 Traditional wreath of brightly coloured flowers; suitable for funerals and can be specially made for Anzac day. Anzac Wreaths available on request.